I saw a similar (exact?) top on Jill at Doused in Pink and loved the look of the larger lace-up grommets. She styled hers with darker pants, but I opted to lighten the look of this lace-up top from Romwe with white jeans and leopard flats. Unlaced it has a deep v-neck so I added a cami for modesty, but if it is tied, you could easily go without. For the price, I am pleasantly surprised at the quality. I sized up one size to a medium and the fit is spot on. I am a big fan of scoop hemlines because I find them to be more flattering around the hip area. A hemline that is straight across draws your eye across and makes that area appear wider, but this top looks good tucked or untucked! Can I get an amen for versatility?! The top looks great on its own, or it can be layered under a cardigan or blazer and the lace up neckline adds interest. And for all under $13, you can't really beat it. Make sure to stop by tomorrow for a fab giveaway! what a pretty top, love the lace up details. Love the all live lace up with the larger details like you mentioned. Looks great with your white and leopard! Thank you for the shout out! That top looks great styled with white and leopard! I'm going to have to try it with mine! Love this cool lace up top with the white jeans! You've inspired me to pull them out. Amazing look Laura! Yup, I love this type of top on you too- especially paired with the leopard! This top is so adorable on you! I love how you paired it with white jeans! And the shoes go so perfectly with that color top!! See, even more versatility!! I really think the white jeans add a modern vibe---I need to pull my out! I still haven't grabbed a lace up top and I'm loving this one! I'm crazy over pairing the olive with leopard. What a pretty, classic look! I like that the laces are thicker than your typical lace-up top! I love this lace up top with the larger grommets. I also really like that you left it untied for a more casual vibe. So pretty with white & leopard! This is super pretty! I love olive and leopard together! And the purse adds a fun touch, too! Olive, white and leopard is such a great combination. And the burgundy purse is gorgeous as well. The oversized grommets do make this a really fun top! Olive look great on you. Have a great week. Wow I can't believe that top is only $13! It looks way more expensive, I really enjoy the lace detail. You did a great job styling it - you look beautiful! So cute! 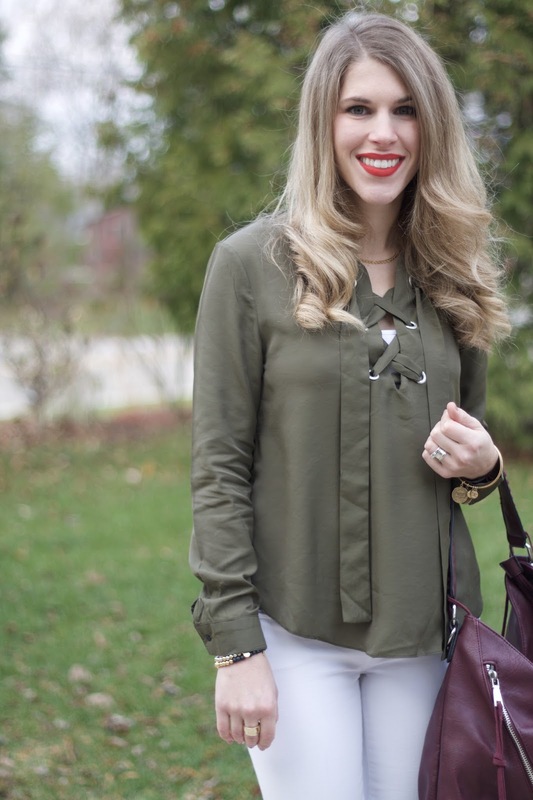 Love olive and leopard together! Love the idea to wear this with white! !